A MAPCO Mine reclaimed a coal surface mining site to include a fish hatchery. This hatchery (shown above) commercially raises fish for sale to markets on the East Coast. The land was reclaimed as a forest/wildlife area with fish & game habitat. One example of modern day coal mining contributing useful business and restoring the land to a natural state after the coal has been mined. A former surface coal mine was reclaimed to pasture and farmland in Kentucky. 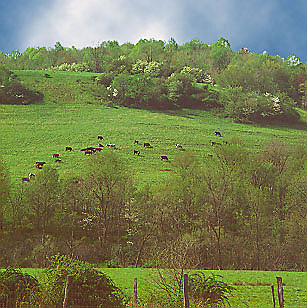 Notice the cattle grazing on the hill sides. Prior to mining the land was overridden with weeds and of little use to man or beast. Now, it is a pastoral scene, with the land value soaring from $200/acre, prior to mining to $1,200/acre after reclamation was completed by the mining company. The owners of this farm will definitely agree that the mining company involved is a Good Neighbor! Another reclaimed surface coal mine in the Mid-West. 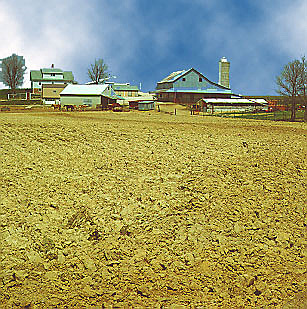 The land was returned to use as a productive farm after the surface coal mine depleted the coal reserves.